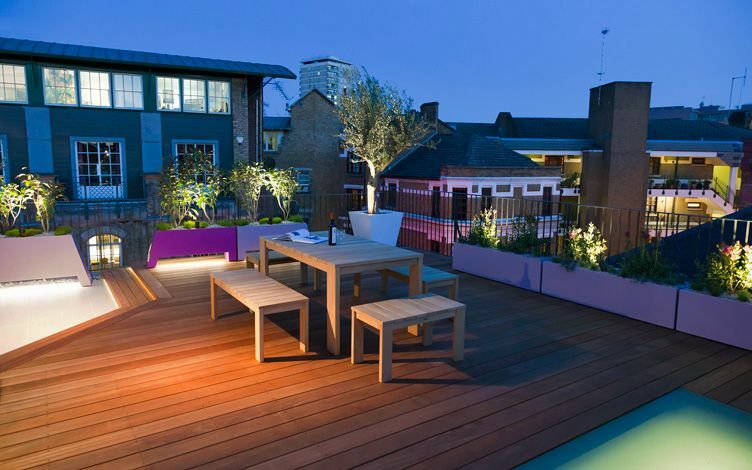 This private Shad Thames roof garden presents clear views of Canary Wharf and the Shard, where an expansive hardwood deck, artificial grass, porcelain tiles and offbeat fitted planters mould the outdoor space into intimate areas, while a custom-built bar, augmented with seating and warm lighting, provides a cosy hub. 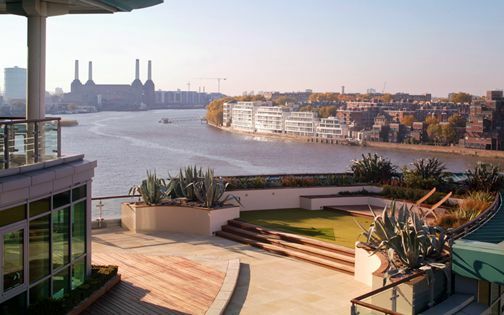 Our clients sought a contemporary roof garden abundant in functional zones to entertain large groups of guests frequently, and complement their luxuriously renovated loft apartment, amid a unique wharf backdrop. 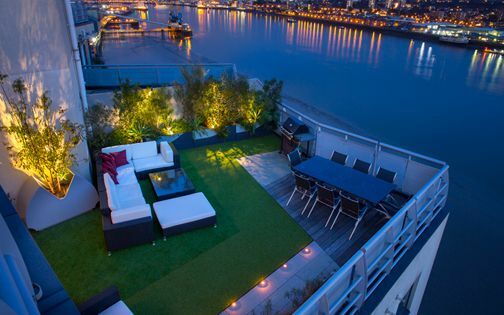 Situated atop a converted London wharf, the rooftop was fairly neglected when we first visited, yet presented extensive landscaping potential. 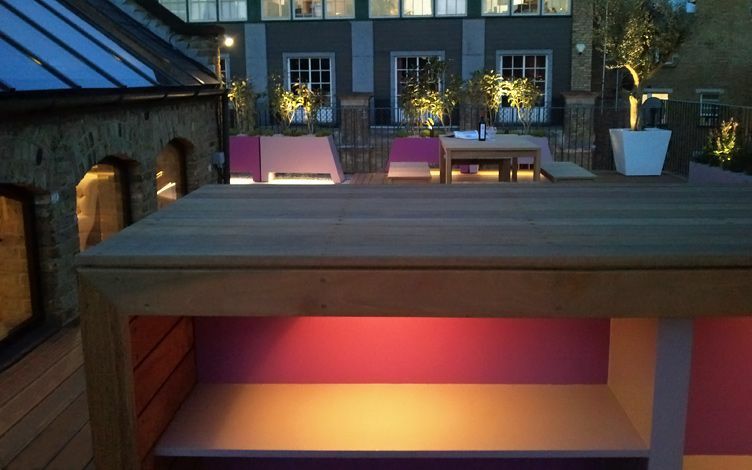 With the outdoor space cleared, a specialist team installed a contemporary skylight, surface insulation and a new glass facade. 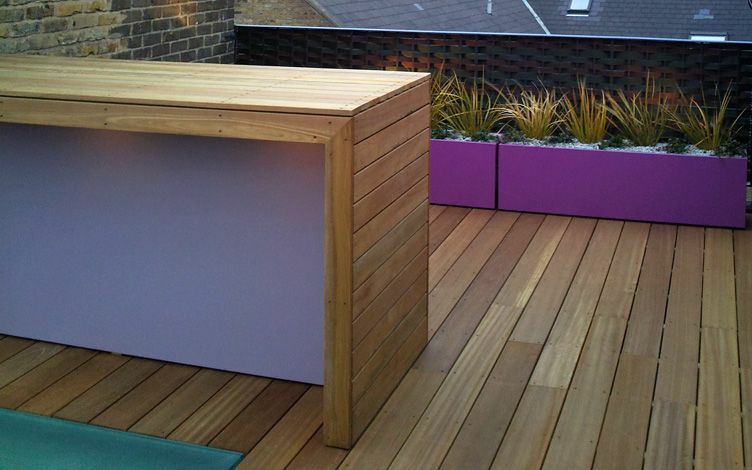 We matched the decking's height flush with its skylight, enabling an additional pair of steps towards a tiled lounge. 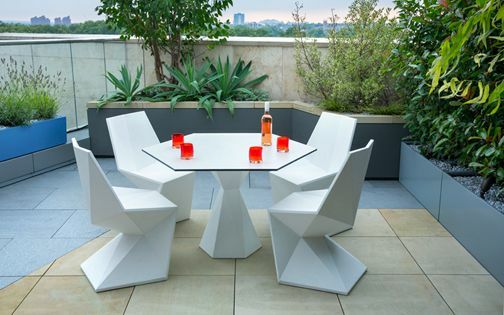 The layout's angularity generates optimal ergonomic transition, while highlighting dynamic chill-out zones. 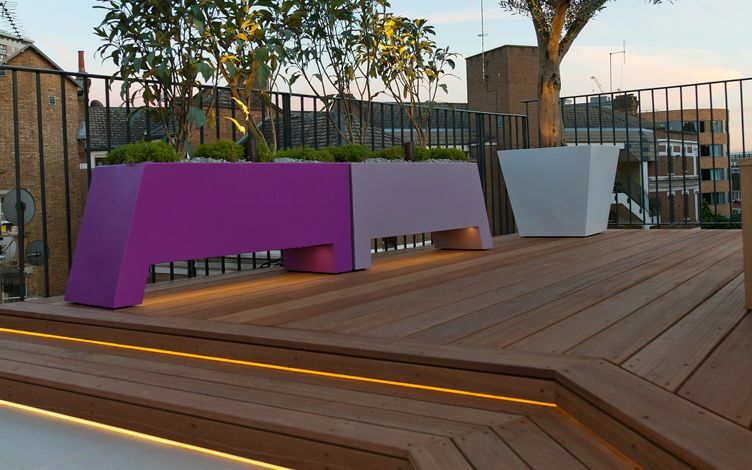 To screen neighbouring offices, we designed pairs of eye-catching bespoke planters, contrasted by a natural materials palette, creating renewed verve amid an up-to-date loft terrace. 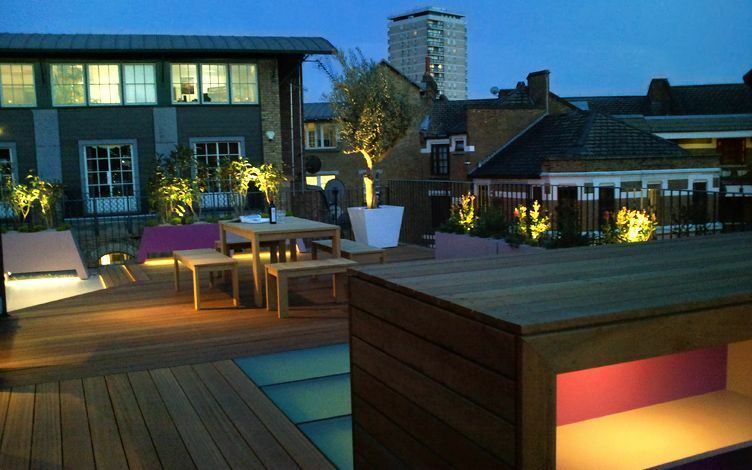 A prominent Shard vista provides gripping focus towards London's city landscape, enveloped by a built-in bench and a spacious bar counter which define an upbeat rooftop social hub, where barside activities are refined with comfy outdoor seating, integrated shelves and a vibrant colour scheme. 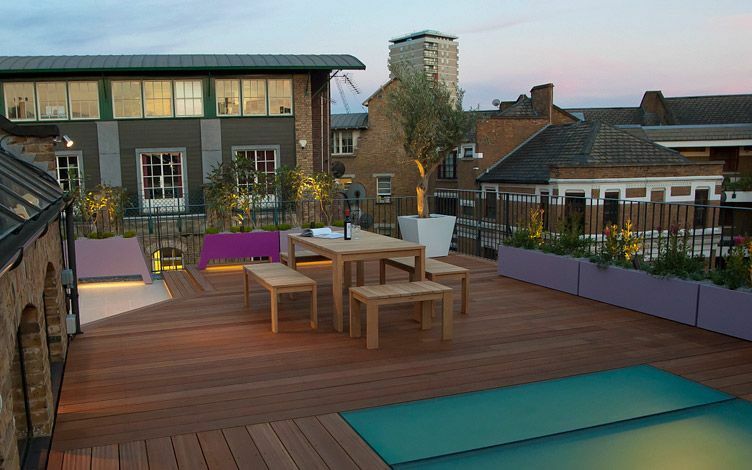 A fabric screen, skilfully woven onto the balustrade, augments privacy and texture, increasing seclusion while infusing dynamic focal rhythm. 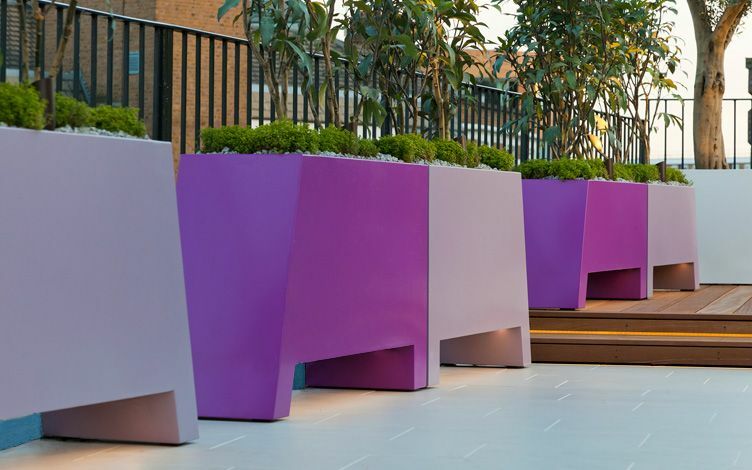 Views from nearby office buildings are filtered by an architectural sequence of custom-made planters, where each pair is powder coated in contrasting mauve and heliotrope hues, shaping a discrete elevation of sculptural evergreen shrubs. 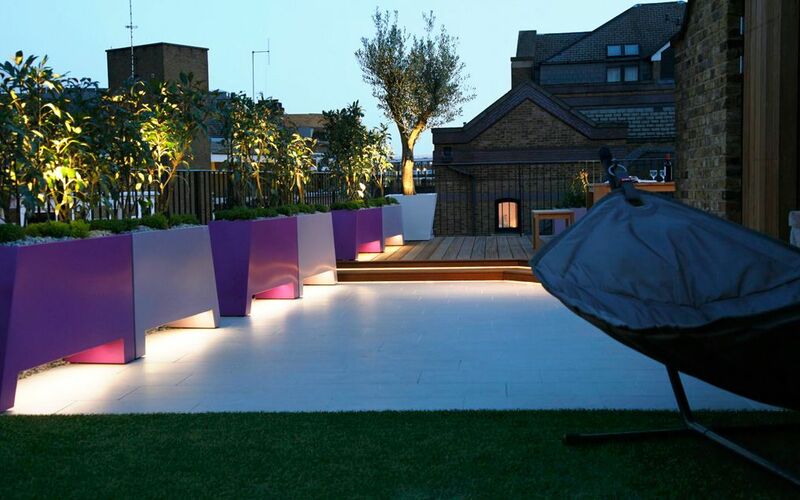 We selected a large Olive tree specimen which we craned utilising a furniture lift, accentuated by a tier of fast-growing Callistemon. 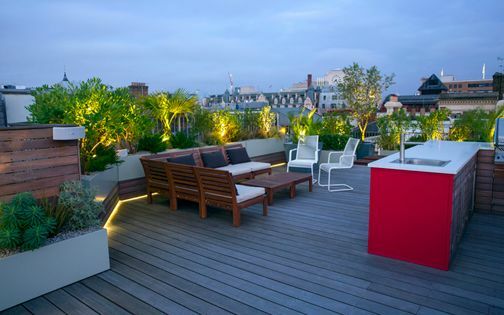 The Australian Bottlebrush produces striking scarlet flowers in this roof garden's summer sunshine, while Pseudopanax from New Zealand is underplanted with yellow Thyme, thriving in the shelter and optimal drainage system of a sunny South London roof garden. 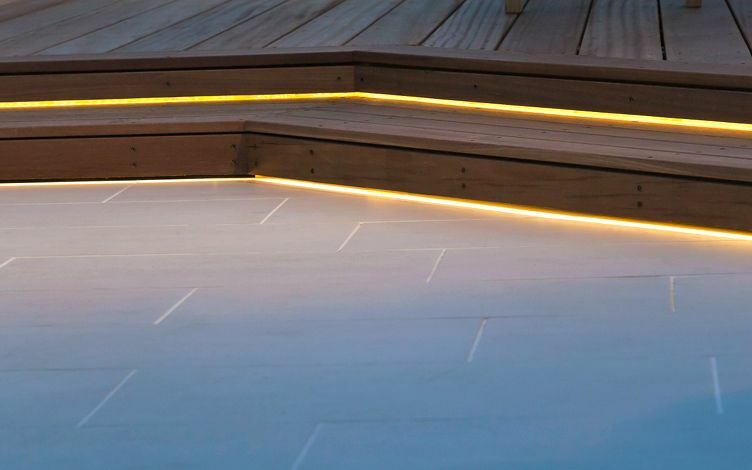 The 70cm-tall planters provide abundant space for flora to flourish, as low-key LED lighting emits a mellow afterglow onto white tiles via a 15cm recess below the troughs. 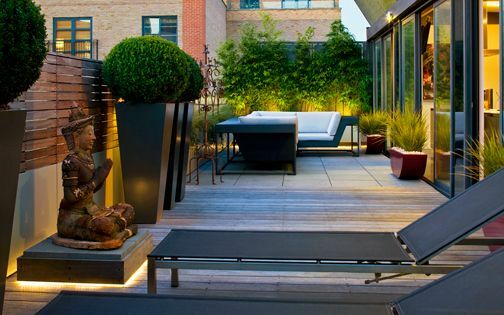 This layered rooftop planting scheme maintains ample texture and scent, where culinary herbs infuse an invigorating wildlife essence, alongside an interplay of scale and perspective. 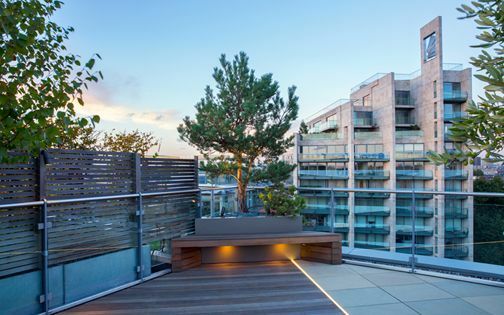 A myriad of authentic elements remain sensitively preserved in the wharf's framework, where a clean-lined roof terrace design reiterates inherent colours, details and textures contemporarily, while integrated into a conservation area. 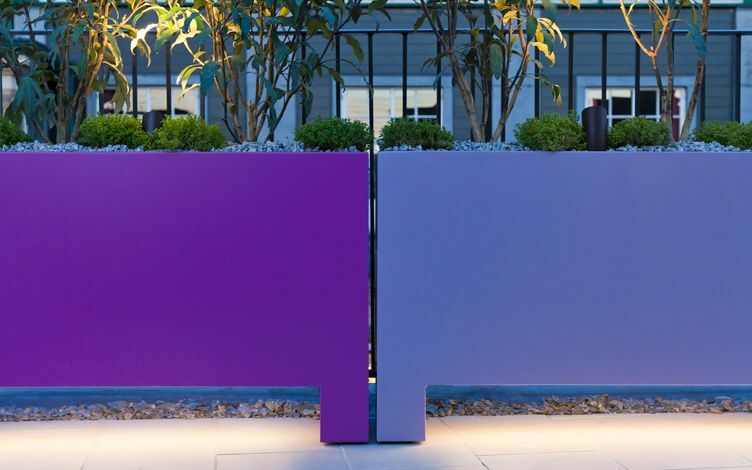 With a new glass skylight creating an up-to-date benchmark, generating vitalising light and extending functional surface, the planters' angles energise movement by enhancing sense of depth. 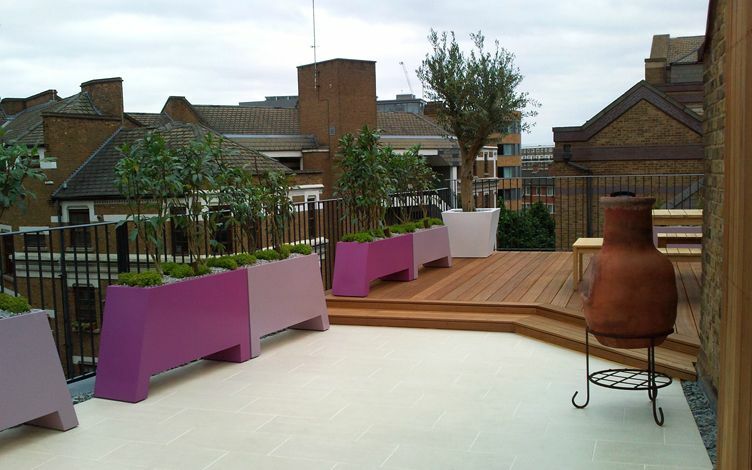 An Olive tree forms a solid focal point, viewed from various vantage points across the roof garden, while the containers' angular apices echo their local roofline architectural detail. 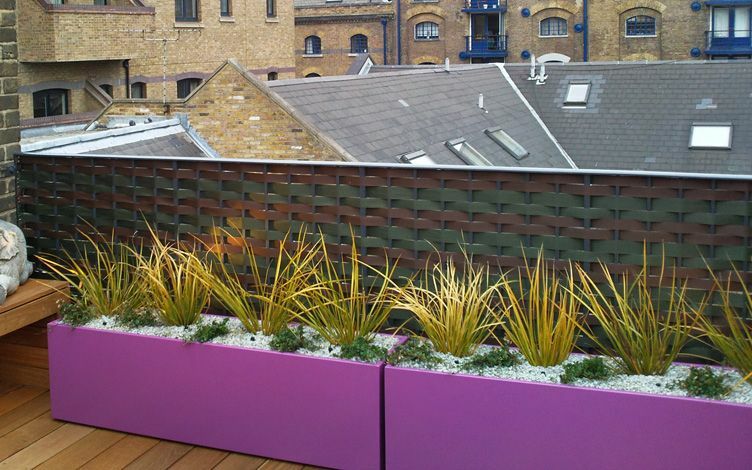 By delineating Shad Thames' quintessential characteristics, as well as within many London river precincts, we continually develop and extend our roof garden project trademarks atop London wharves and docksides – outlining modern, liveable, urban terrace methodologies.